I have been meaning to post this for over a month, but first wanted to exhaust/navigate all the posts made pertaining to our pigs' tentatively diagnosed issues. They are two rescue, intact boars we've had for about a year and a half. I apologize if I am going about this all wrong or failing to follow guidelines of this forum. I was certain I would create two separate medical threads for both pigs, but am anxious to get their information out on this forum for any willing members to hopefully assess and provide their own input. It's been a very long, disheartening 2.5 months and I keep arriving at the same unnerving indecision, concerning our choice of vets we've been seeing. Butter, we're not sure of his age he's possibly 3-4 years old (the rescue claimed he was 1, maybe 2, but that was definitely not the case when we went to pick him up). Peanut is now roughly 2 years old, our first adoptee who was by himself. They came from separate locations. Both came from tiny cages (they honestly looked like travel carriers), were fed yogurt drops, and not sure if they recieved hay. Quarantined them for a month, then placed them together. They eventually bonded without much of a fuss. We tried to give them a lot of space. Now they can't be without the other. Our set up is C&C and fleece changed out daily, with bed liners that are changed out twice a day, 3x's if we manage to pop home during lunch. Hepa filter is located nearby and we just splurged for a dyson because it has an intense hepa... (oy vey). Switched to orchard grass as a "process of elimination" attempt to see if it helped Butter's leaky eyes. It appears timothy was the culprit. Had a not-so-hot experience with the nearest exclusively-exotics vet the first month following the adoption of our pigs. After our first experience with this clinic we thought we were out of luck and without other options. They prescribed Butter bactrim for the opaque nasal discharge we noticed after placing him with Peanut (Peanut appears very fit and offers no signs of anything going on), following their quarantine period. No offerings for a nasal culture (At the time if I had understood that was an option for pigs, you bet I would have asked for one). He immediately went downhill on bactrim. The vet didn't seem too interested and didn't offer any other suggestions. (They also did not suggest probiotics) We discontinued it and decided we weren't going back. Butter gets UTI in January (7 months after adoption). We have a strong feeling it was due to stress from us taking them with us to Missouri for my signifcant other's brother's wedding. It was a long drive to and from. Roughly 10-12 hours one way. Stupid decision, but could not find someone to look after them for a week. We made sure they were kept at the right temp, watered (via wet veggies since they weren't interested in the bottle during travel), fed, and given enough space to move about in their respective extra large laundry baskets with fleece and hidey homes. We'll never do it again. Upon our return, Butter stops moving about and just lies there bloated. Went to emergency at same vet clinic, they did not handle him well, he became so stressed out he went totally limp and I thought he had passed right then and there. I think he was in pain and shock. Never again. Prescribed Baytril and metoclopromide, and meloxicam. No suggestion of probiotics. Started to go downhill (not as quickly as with Bactrim) and with research (when I stumbled onto GL) we got a hold of some benebac. He came back slowly and we eventually beat the UTI. Spring and Summer passes and we are overdue to find a new, reliable vet. 11/4/17 Took him into a new clinic over an hour away (car travel has become very hard on them, no matter what we do to try and make it easier--rescue remedy spray... no excess noise that can be helped. Lightly covering the top of basket with fleece so they don't see movement. Tried holding them in their soft covered beds in our lap). Anyway. We see Robert Ness, he says Butter checks out okay, they go off of old x-rays from his UTI emergency visit (which didn't show a side view of his knees, that becomes important later) and take blood. They don't have time to give Peanut an exam. Not happy about that. I asked for Butter to get a respiratory swab, they don't do it. They say he seems fine. Days later blood work comes back, elevated WBC makes him want to put Butter on antibiotics asap. I don't like that we don't have any reason leading as to why he has an elevated WBC. He says his liver and kidney values aren't great. If there's something I dislike the most, it's throwing antibiotics at something blindly. He prescribes bactrim. Even with probiotics, he does poorly and within 4 days I keep leaving messages that he's not doing well at all. I read on GL it could be intolerance. He gets back to me on 6th day and says it must be the infection making him worse, not the antibiotic. I press for a different antibiotic. He gives us Doxycycline on 11/15/17. Butter does better on it. His typically runny nose and eyes are drier (at this point we don't know what is causing a high WBC, and not even considering it has to do with his respiratory). I officially write off Butter to be intolerant to bactrim. 11/30/17 One day following the last day of doxy (14 days) Butter starts to puff up, appears to be in pain. Just days before he seemed to have been doing well having regained his own appetite (was syringe feeding him during bactrim and after recovering from bactrim). I notice a darker spot/chalky residue in the middle of his urine spots, a brief panic later I apply a urine test strip to test for blood. Not positive for blood. (Side note, Butter has had history with bladder sludge. Diet alterations has kept it at bay). I call and ask vet if it would be possible to get some meloxicam. He's still puffed and even with extra probiotics, stools not getting better. They refuse, unless I bring him in. We can't go in right away (car battery dead or take $100 cab), so I make an appointment next day. Later in the day darker brown chalk spots in urine. Just the browned chalky spot tests in the center of his urine spots positive for blood. I have him pee in "sterile" plastic bin to do a full dip. No traces of blood. Blood appears to only show up in the chalky center of his urine spots. Like the yolk in the center of a cracked egg, but this ratio of chalky blood spot to urine is much tinier than a yolk:white ratio. I look everywhere for some posts made about calcium crystals and blood, I want to understand if this is a UTI or not. I flush his bladder with barley water and fluids while we wait for his appointment the next day and I trek out for a new car battery. 12/1/17 Next day car still doesn't work, so we cab it. Earlier that morning, no traces of blood in the chalky portion (center) of urine spots. Same clinic, different doctor, they finally take nasal discharge swab, do new x-rays, blood work and urinalysis. No blood in urine, just 11-15 calcium crystals. Lowered WBC (inconclusive about if it's sufficient? Like does he still need to be on antibiotics?). And new x-rays show hecka bone spurs and "violent osteothritis" on his "huge" knees--their discouraging words, not mine. She says to stop the barley water because it's too starchy. I do stop when we get home. We get sent home with (surprises, surprise) meloxicam. They offer we can also try hemp leaf juice. Aka watered down CBD (cannabinoid). 12/2/17 Meloxicam does not do much of anything at .45mL every 24 hours. They suggest every 12 hours. Not much improvement. They suggest .9mL now. By this time it's 2 days later, I went and bought CBD oil and started that at .25mg of CBD when needed. It helps immensely. I don't take their suggestion of increasing meloxicam (they mentioned his kidney and liver values were not good?) and keep him at .45mL every 24 hours. We find a good groove that works. I should mention the 2nd vet we were seeing at Ness Exotics (Dr. Golan) was only part-time so we had to consult with her coworkers and not her. She's only there for a few hours every Wednesday. Still awaiting nasal culture. Peanut still hasn't seen anyone at this clinic. 12/13/17 Roughly 2 weeks later we recieve results that he tested positive for pasteurella and strep. The culture showed they are susceptible to Azithromyacin and Chloramphenical. They want to start Azithro immediately. I look up Azithro and do not read good things about Azithro and guinea pigs. But we need him started on something soon. One day into azithro, and Butter does poorly & immediately has a bad reaction to it. I try to pad it with food and probiotics ahead of time and afterward. I learn from GL that Azithro can be nebulized in order to bypass GI tract. I call in on third day to request this and of course she's no where to be found because she called me on a Wednesday with the results and now it's Friday and she won't be in until next Wednesday. No one has any advice other than he has to stay the course now he started it. And they never heard of nebulizing azithro. This is probably a good time to mention that this clinic, Ness Exotics, is founded by Robert Ness (the first vet we saw) and Oxbow consults him on their tablets/treat supplements. Apparently. He touts holistic approaches, does acupuncture, and provides chiropractic therapy. He's into the Assisi loop (I can explain a little more on that if anyone is interested). He believes in using "Chinese approaches" to medicine. But I haven't seen any evidence of that yet. Other than he pronounced a few things incorrectly (Grew up in Beijing/mom is Chinese) but I didn't judge him harshly for that. I was confused and admittedly a little disappointed that he didn't take more thorough care in assessing Butter, and that his practice had never heard of nebulizing Azithro (and would also not do it for us, just cuz I guess). We push through with the azithro for the next few days. Flax oil helps, among many other things. He gets dehydrated pretty badly, I have to push the fluids. I keep up with a lower dose of CBD and that seems to help whatever discomfort he's experiencing and encourages him to eat, move, and drink a bit on his own. 6 days later, he's still sneezing up opaque nasal discharge. Now Peanut suddenly starts showing a singular weepy eye. We've never, ever seen him get weepy eyes. I read up and hope it's a clogged tear duct. We do a series of warm compresses and some non-preservative sterile eye drops just in case. He doesn't seem to tear up for a day and a half and we hope it's okay enough that we can wait to take Peanut for his wellness check during a follow up appointment for Butter. 12/14/17 The singular weepy eye returns and my nerves get the best of me. We can't make it out to Ness Exotics and it's a Thursday so our vet Dr. Golan isn't even there. Butter also gave me a spot of blood in the middle of his urine puddles on his bed. I only see one deliberate small blood spot (scared the lights out of me because I've never seen it so bright red). I push the barley water, and test multiple urine puddles. No more traces of blood. Would like to have him tested anyhow to be sure so we decide to make a next-day appointment at Chicago Exotics, a decently recommended exotic vet, also a bit aways--but not as far as Ness. We didn't go with this vet before solely on the fact the office manager was a dismissive arse-face when we were trying to ask a few questions about their practice. That's not a great criteria to base you decisions on, I realize. But she was wonderfully unhelpful, to say the least. 12/15/17 Peanut is put under (after they don't hear signs of a heart murmur) and has really bad --what they called-- "snorkeling" when he comes out. He does not look good and appears very uncomfortable. X-rays show fluid in his lungs, as well as an enlarged heart and liver. We are beyond devastated. They say the next thing he needs is an ultrasound, which is a whole day ordeal of holding them in a crate and waiting for the radiologist 4 doors over to have time to do it. My concern is, how do you place a pig with an enlarged heart under anesthesia to get an ultrasound? I can't get an answer. He also has a dental pocket (unsure about this) With an abscess. They believe that is what is causing the weepy single eye. The vet briefly looks at Butter's x-rays They prescribe him lasix (0.07mL twice a day), enroflaxin (0.26mL twice a day), a pathetic/ineffective amount of probiotics, and meloxicam. I make an independent (and sleep deprived) decision to not administer the meloxicam to Peanut if his liver is so enlarged. He seems alright without it, though I am nervous if he needs it to bring down the inflammation? Doctor was gone from the clinic by the time I thought of that question. I get home and read on tooth abscesses and don't see anything about enroflaxin (bayrtril) being the choice antibiotic for abscesses. I become a little concerned. I also "up" peanuts probiotics from what they prescribed. He does fine on the antibiotics and diuretic/lasix. He was always good about eating his own beans and drinking water. Butter never ate his own poos and has been drinking less water (not helpful). Peanut ends up laying down a bit more than he usually does on 3rd day of medications. It worries me a bit. Butter's urinalysis comes back negative for blood, cloudy but no crystals present, no bacteria, no ketones--but dehydrated with high specific gravity (1.012). She recommends supplementing 10ml/day with fluids. I determine that is not enough and aim for 20-25ml. She suggests an ultrasound for butter as well because she thinks she sees some calcium formation in the kidney. She also believes both need teeth trims, while Ness and Golan did not think Butter did (at least). Wish I could have gotten an opinion on Peanut from them. Days later I learn that our current vet at Ness Exotics (Dr. Golan) actually practices at Chicago Exotics as well on Fridays. I leave a message asking if she would consider looking at Peanut's xrays from the other clinic (that she works at) and offer a second opinion. Of course the answer is, "he's not my patient." I don't think I need to explain why that burned me up a bit, since she and all the other doctors at Ness Exotics are all willing to pitch in with opinions on a patient attending their clinic. If the xrays are from a clinic you are also practicing at, is it really compromising things for you? I try and reason, and she says yes she can take a look since she will be there Friday. Following a review of the xrays she can send over an approval for an echocardiogram (heart ultrasound, $425 buckaroos btw, but what's that compared to the $2k we've already spent this year? Oh well). It also takes almost 2 weeks to get an echocardiogram scheduled, I might add. So the sooner the better, if that was going to the be the next course of action? Or perhaps not? Who knows, there's no one I can ask at this point. Friday (yesterday) she gets too busy and can't speak with me. I also want to update her that Butter, now 9-10 days into azithro, still has nasal opaque nasal discharge. Also, Butter has blood again in the center of his urine spots. This is on me, as I have been working and wasn't able to pump more than 8mL in him the day before. I had been giving him 20-25mL everyday since the last blood spot. This time I went ahead with more barley water and a half dose of Shi Li Tong. It would be also great to talk to her about Peanut and how I learned about baytril not exactly being the drug of choice for abscesses (and that he still has a full on weepy eye 7 days later with the antibiotics--something the Chicago Exotics vet told me to check-in on with her in 7 days. But oh wait, she's apparently only at that clinic every other Friday. So how was that going to work?). The receptionist offers that I can leave a question for one of the doctors there to answer and get back to me on. I calmly explain this is a matter that is rather involved with Dr. Golan directly, and we had scheduled a conversation. Then the Chicago Exotics office manager takes the receiver and firmly states (shouts, really) "Peanut is not her patient, so it's inappropriate that---" then I "dropped" the call because it was better for both of us that I did. So it is now the next day at 1:10 am on 12/23/17 and I've got one piggy with blood in his urine (well, only in the centers of his urine puddles, the "yolk" portion of his eliminations sotospeak) And another pig on enroflaxin (baytril) for an abscess underneath/around his tooth that may/may not be helping his abscess. I have test results and x-rays. I am very "green" about uploading images to this thread/learning who I ask permission from to do so. If anyone has any interest in this novella of a situation, I would be very grateful for any analysis, input, and opinions on the matter. If Butter's blood in his urine turns out to be a full blown UTI, is it possible to do baytril at the same time as azithro? I'd hate for that to ever happen. He's on my lap now as I offer more barley water to him. His eliminations are reading with far less traces of blood, practically none. Though I fear I'm just "diluting" his bloody urine situation. And how does one go about getting a more detailed heart diagnosis on an enlarged heart pig? If ultrasound is required, they have to go under anesthesia, according to Ness Exotics and just about every place we've called. Should anyone view Butter's xray, does that look like calcium in the kidney to you? Does he also have dental pockets? I wish I had a better idea of what dental issues looked like in pig radiographs. Also, it seems rather impossible to get teeth trims for enlarged heart pigs? So I hope we don't actually need to get a trim done for Peanut. I should mention that we have been weighing our pigs everyday and their weight has stayed consistent---besides the times it hasn't with Butter when he was having issues with the bactrim. Thank you for reading, again I apologize for inconsistency and tense issues in my writing. I am sure I am doing something wrong here... that I'm plugging this in the wrong part of the forum, or titling it improperly. I was naive to think this would be a relatively simple adoption of two pigs. I am confident they came from a darn pet store and have genetic issues. I planned poorly and did not secure a good vet before obtaining them. I feel foolish and admittedly a lot of pain in how helpless I feel in guiding them through all this. What makes me the most uneasy (by uneasy, I mean pit in stomach, devasted), is that I don't have a reliable vet I can consult with. Wow, what a saga! I'm sorry you're having such a hard time finding a decent vet. You can send x-rays to Lynx and she'll post them for you. She'll come along and see this and post a gif of her email address. She doesn't do plain text addresses because bot harvest them. Most pigs with heart problems don't get ultrasounds, simply because most clinics, even exotic ones, aren't equipped to do them -- either don't have the equipment, or the person qualified to do the exam, or a vet who can read it. Or, the owner can't afford the procedure, or the pig is too sick to be anesthetized. The usual pathway to diagnosis is symptoms, seeing an enlarged heart on x-ray, trial of one or more heart drugs to see if they work, tweaking as necessary based on the symptoms and any improvement. Here's our link to heart info: http://www.guinealynx.info/heart.html. So if I were you, I'd ask for a heart med trial for the pig with the enlarged heart. I would not have anybody's teeth trimmed unless they're actually showing signs of needing one. I agree that baytril is not the drug of choice for a tooth abscess. As far as I know, ciprofloxacin penetrates well, but it's pretty rough on a guinea pig. Abscessed teeth are hard to treat. We've had a few pigs survive having the tooth pulled, but I know of quite a few who haven't made it through that procedure. I doubt seriously that the stress of the trip made your pig ill. Mine have survived long car rides with no problems whatsoever, as have many others. Guinea pigs aren't quite as fragile as some people make them out to be. I'm going out on a limb here and saying that I doubt that the blood drop in the center of the dried urine puddles is from a UTI. IMO, that would show up as blood in the urine, which would dilute the color of the urine, not leave a dark drop. To me, that definite drop implies that the blood is being secreted after the pig has urinated, and is coming from somewhere outside the bladder. It could be from the urethra (maybe a bit of hay has gotten stuck inside), or from some other place in his genital area. The exception to that would be is if the blood is a clot -- then you'd get the discrete drop. But you also should be able to see whether it's a clot if you can catch it right after he pees. As far as I know, blood clots in the urine are a common sign of kidney stones, and that's another hard condition to treat. Herbivore urine is basic, where as carnivore/omnivore urine is acidic, and we don't know nearly all we need to know about herbivore urine formation. My guess is that there's not much that can be done about it, although it may not cause him any problems for quite a while, if ever. There are several exotic vets in Chicago. I'd suggest calling some of the guinea pig rescues in the area and asking if they can recommend a good vet. We have a list that may or may not be complete -- there's a link at the bottom of this page. I'm sorry I don't have more info to offer here, but please do keep us posted on how they're doing. First of all, I am so sorry that you have gotten the run around from just about everyone. I have had the same problems with legitimate exotics vets and I have been vexed to the point of thinking that, short of me becoming an exotics vet myself, there is no hope. And I am a large animal technician and find it so annoying that I can’t seem to find a suitable “go-to” vet for my guys. I have one guy that is great with orthopedics and one radiologist. Yet to find a stellar doc that does medicine cases well, despite the variety in my area. So I empathize with you. Have your radiographs been read by a board certified radiologist? If not I do have one that I highly recommend that did a residency at Tennessee which has one of the best exotics programs in the country. He has read rads for me and is very thorough. Also I’m sorry if you covered this, but did they perform a sensitivity on the culture of the nasal discharge or did they just identify it? OR you could opt for treating the pig with an ACE inhibitor and see if he responds well. That, in a round about way, would also give you at least a partial diagnosis and is what most people end up doing. As for the pig with a diastema/abscess, does he have any foul odors coming from his mouth? Is the abscess affecting the upper molars and on the same side as his affected eye? Is he eating oddly? Did they stain the eye that has chronic tearing? And does he seem painful in the eye? Tearing can definitely denote pain in an eye, but is he squinting it as well? The posting of radiographs and lab reports is always welcomed here. Thank you for your response to an evening of writing muddled with emotions! I should have slept on it before composing. I'm am very impressed you made it through the whole saga. Ness Exotics apparently has a specialist who comes in to do echocardiograms (aka heart ultrasounds, as it's been explained to me) for their exotics. Sorry if I'm repeating myself. Her name is Dr. Buscio and I found out from calling around she also visits a few other clinics around the area to do heart ultrasounds. Anyway, that's very interesting to know the typical methodology for heart disease diagnoses for guinea pigs is symptomatic. I took a look at all of he enlarged heart pig x-rays that there are helpful links for on the heart page and I'm afraid I just can't make heads or tails of the images of the hearts when comparing it to Peanuts enlarged heart x-ray. He currently does not exhibit any obvious signs of heart issues. We only "caught" it since we were getting x-rays for an all over wellness check/getting his single leaky eye checked out. I appreciate that extra information about kidney stones and blood clots, I have absolutely never read or heard of that before. I apologise if I missed something about on the information pages available here. Last night I shot an email to Critter Corral, a guinea pig exclusive rescue that's relatively located in the area. I really should have done that sooner. You can send clear crisp pics to me to post. I may only be able to post a handful. Have you read over www.guinealynx.info/heart.html ? It is difficult to impossible to pull absolute recommendations from this site and posts. I recognize that you are trying to do your best. The info here is guidelines and from people who share their experiences. What complicates things is that there seem to be multiple issues. Do the xrays confirm a tooth abscess? Was there any indication of stones or sludge in the xrays? Are the urine deposits powdery (normal) or gritty? Gentamycin is often nebulized for serious respiratory issues. Thank you for your insight and for relating to my situation with vets! I am sure I've only experienced not even half of what people have gone through with exotic vets that are supposed to be "the best on the area." I will also remember to reference names when responding here. We would LOVE another opinion on the radiographs. I do not believe an actual certified radiologist has read either of our pigs' x-rays as of this moment. That is a good question to ask at any future appointments. What can I do to start that process with your radiologist connection? For the nasal culture, yes it is my understanding that they did a sensitivity test to the strep and pasteurella. They offered azithromycin and chloramphenicol as the two options. But after we started the azithromycin, they disclosed a few days later that the cultures were also sensitive to two separate drugs as well. I am not sure which was sensitive to what, but apparently one was sensitive to doxycycline (something Butter did well on) and the other was a drug available nebulized... they didn't dwell on the name long and I asked them to repeat it: it possibly has an am-cy-lin in its name? I wonder if it was gentamycin. I am sorry I didn't ask for a spelling. I was mostly angry that we may have been able to go that route--though they reminded me that there may have been a greater risk being on two antibiotics at the same time. I actually really wanted to know what others thought of that. Not that we can do anything about it now. I saw that about ACE inhibitors on the heart pages. I appreciate that you believe that could be an approach in our situation. It offers an option, which (I have to remind myself) is better than no options at all. A note about lasix, how does a diuretic cause a build up of calcium if it's supposed to be relatively "flushing" things out? Does it have to do with potassium (which apparently clings to calcium?) leaving the body too abruptly to "cling" to the calcium? And the calcium gets to hang out longer because it's, awesome? Eye situation on heart pig: It appears he is no longer squinting as much with that eye. I forgot to add that he was doing that from time to time before we took him in. He did receive an eye stain and it came out "clear," as in no evident abrasions or inconsistencies were found on his ocular surface. Thank you for bringing that up. I wish I had more information on the abscess and its direct location. They were gathering all the information from the X-ray only, it seems. Since the location of the abscess is... A little hard to determine on the X-ray apparently, they said it could be a tooth root thing or even a piece of hay that caused it. You can probably guess I'm wishing for it to be hay, but I won't bet on it. As far as mouth odor goes, I haven't smelled anything unusual--it smells a bit like the mouth of a pig who eats his own feces. He eats the orchard grass ravenously. Previous to the orchard hay we started in early November, they did have some stickly-pokey "2nd cut Timothy," which we won't order again. Carrots he's a little odd on and he will like incinerate them into a million consistent pieces. But that's been for quite some time. Since this last spring when we began noticing it. I read about that possibly being related to dental issues, but he wouldn't show that behavior with other hard foods and from time to time Butter would do the same thing and he was cleared for dental. I regret not getting Peanut fully vetted for that sooner. Though at the time we didn't know of any vets we felt we could trust. Are vet visits extremely traumatic for anyone else's pigs as well? Important edit: I am sorry I did not carefully reread my post. To clarify "The vet briefly looks at Butter's x-rays They prescribe him lasix (0.07mL twice a day), enroflaxin (0.26mL twice a day), a pathetic/ineffective amount of probiotics, and meloxicam." --- The vet briefly looks at Butter's x-rays, is an incomplete sentence. The pronoun I'm referring to in the following sentence is actually PEANUT, who received the prescription for lasix and enroflaxin/baytril. Lynx- Thank you for the address, and it very well could be gentamycin. I have read the heart pages, but am going to definitely revisit them again. For Peanut's tooth abscess, I am unsure if the x-rays confirmed this. Am looking for another opinion from another vet hopefully next week. Would love anyone's input as well of course in case anything was missed. For Butter's sludge history and yes current powdery/borderline grit urine, I am unsure if there are any visible signs of stones or sludge in the x-rays. When he has enough fluids, his urine is less powdery/gritty (Sorry if that's an obvious observation. Just throwing it out there) Dr. Golan did not mention or see any sludge or stone formation. Chicago Exotics Dr. Strat said she saw some calcium formation in the kidney on the same x-ray Dr. Golan had been viewing. No mention of sludge. I'm not sure if it's because they don't have an eye for it? Small "update," hitting a wall with the clinic that treated Peanut's tooth/root abscess. They wouldn't consult about changing his antibiotic yesterday because they thought I only wanted to strictly speak to our vet who also works at Ness once a week Dr. Golan, who technically hasn't seen him but works at the clinic Peanut was seen at (you don't need to make sense of this, it's just an account of pettiness). Vet who treated him last week is there every other Friday, so totally unavailable. They're closed today. It doesn't appear baytril is having much of an effect on his weepy eye (caused by an abscess 7 days later. I'm all about following through on an antibiotic and finishing its course (& not creating super bugs)--but I also am not hot about wasting 5 days (everyone returns to clinic next Wednesday from holidays) on an antibiotic that's not doing much for his situation. Any chance using bactrim would be a better alternative? I have read it's better for abscesses on here, and I managed to extract a piece of information from Ness Exotics that Bactrim would be their first choice for a gum/tooth related abscess. 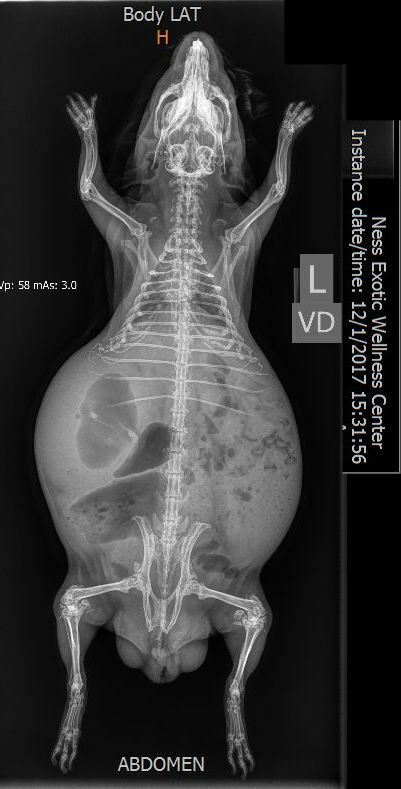 The vet clinic who treated him is closed, other vet clinics said they would require their own x-rays to treat him (not going to do that for now to an enlarged heart pig), and Ness Exotics has no openings, not even for emergencies. Everyone, unsurprisingly, is closed from tomorrow til Wednesday for the holidays. We have an appointment next Wednesday for both pigs at Ness. Here are your excellent xrays. The small ones are pretty good. The large one (which I probably could have resized), I left intact except for cropping and am providing a link. You are amazingly expedient! And I didn't realize I could search out dosages, I've never stumbled across that page, thank you. I called a few other emergency clinics who kind enough to not "gatekeep" and offered their opinion on courses of action for tooth abscesses. One said Baytril, another Bactrim. So that's 2 votes for Baytril, 2 votes for Bactrim. I think I need to be patient and "trust" the Baytril will do something during its course. Those look great!! Thank you so much for posting them so quickly! We are very grateful here. Being able to share our scenario is allowing us to breathe a little more deeply for the first time in a long while. I should have started a their medical threads ages ago. If you stick, "how to calculate doses for guinea pigs" in google, the top four links are to Guinea Lynx, the second one is my preferred calculator. They do slightly different but similar things (it seems hard to explain dosing to people). I think the link in this post may explain better. Butter looks pretty filled with gas. I realize the larger xray is much better for looking at particular things (molars, heart, etc.). Thank you for that link. I can see how dosing can get confusing with mg/ml concentrations in addition to ml/cc measurements. Butter has always had GI/bloat issues since we got him. A little simethicone and exercise to shake off that gas usually resolves it. Now we understand that a lot of the bloat could have been caused by his arthritic pain. Now that's managed (started management following that xray) he's far less bloaty than he was. He moves and eats more orchard grass. Though now he's a bit bloated again, after we started the azithromycin. His pellets are American Pet Diner Critter be Better. I know, weird, but they have probiotics in them with a max calcium 0.8% . Not the best ingredients to be honest, but when we needed to manage Butter's GI issues (we tried Biosponge) we were syringe feeding probiotics everyday. With the pellets we were able to let him "dose" himself. He doesn't get fed a ton of it. I should also point out his post-scurvy bones. He's received vitamin C everyday since we got him, but not sure what his diet was beforehand. The vets suspect the lack of vitamin C in his younger days contributed to his development of bone spurs/osteoarthritis. Though I also learned it's best not to overdose vitamin C as it can also induce bone spurs and osteoarthritis, surprisingly/coincidentally in the knees. There's a bit of a personal experience and a journal article about that but I won't go into that here. The radiologist is Steve Pokorny with Northwest Veterinary Imaging. The vet that took the radiographs would need to forward them on to him for a report. They use a PAC system for DICOM images so I don’t know if they would accept a jpeg. As for the diuretic and calcium. Loop diuretics such as furosemide (or Lasix) actually cause hypocalcemia where more calcium is excreted. Thiazide diuretics cause Hypercalcemia where calcium becomes elevated because it has a higher instance of reabsorption. Has to do with the chemical balance within the cells of the kidney tubules. It is more like potassium gets kicked out of the cell and the Ca takes up its void as a positive charge within the interstitial space of the cells. Loop diuretics have actually been used to treat Hypercalcemia in humans. I don't suppose there may be an image floating around here that provides a visual example of urine "crystals" on a bit of bedding/fleece? I've heard of people reporting calcium "crystals" in their pig's urine as opposed to powdery or grit deposits. I would just love to know if it's something there's a difference between the two and whether the crystals are pretty visible. 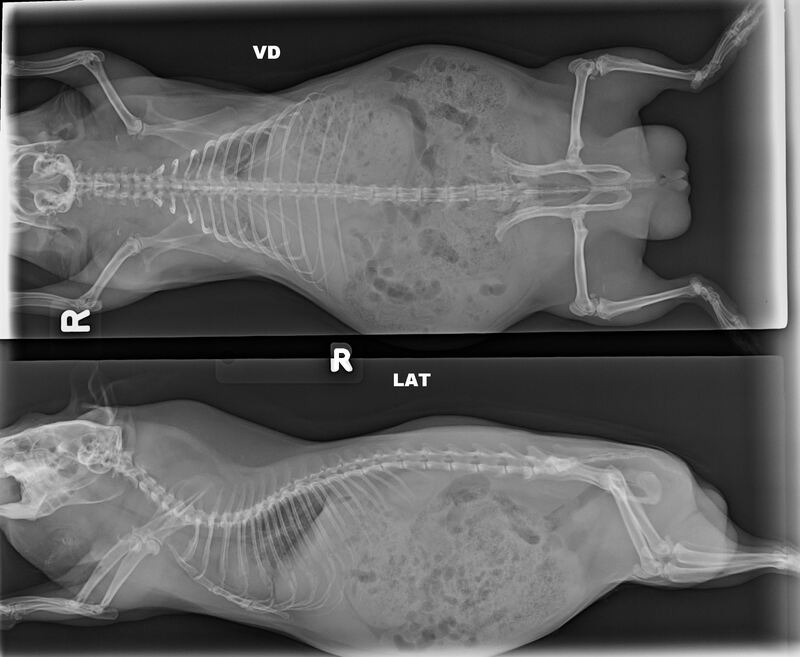 I also hoped someone might know of a radiograph/example of a guinea pig with a kidney stone. I've searched around and have only found bladder stone radiographs. Butter still has quite a bit of blood present in his urine on and off for 3 weeks now since we started all the different antibiotics for his now diagnosed strep/pasteurella. Have kept him on fluids constantly, 25mL per day. He can't take much more, but we do soaked wet veggies and a constant supply of fresh growing wheatgrass. He used to drink so much more water before all this. When he started the antibiotics 2 months ago, he became more dehydrated/blood showed up in his urine but urinalyses at the vets (almost one per week) never showed bacteria or even blood. But here we are today, with his urine spots still testing positive for full on blood. Middle of the urine spot fills out the square positive for blood. The "outer edges" of his puddle has pretty heavy traces. His urine sample right before hand tested negative. I have a long list of questions for the vet. But am nervous they so quickly dismissed any kidney stone issues from the X-rays Lynx posted. I have tried to compare Butter's x-rays with those of ones with bladder sludge, and frustratingly still cannot make heads or tails of it. I had been doing shi lin tong every so often (I think it may cause a bit of extra bloating. Goes away when off shi lin tong. Understandably there's the azithromycin throwing things off and making him uncomfortable. But he does alright with lots of probiotics.) He seems relatively comfortable. I'm concerned about using meloxicam for his pain management (pain from osteoarthritis and pain from wherever that irritation/blood is coming from?) since this may be a kidney thing? I continue to use the CBD. We decided to stop the lasix with Peanut (heart pig with fluid in lungs). One of the emergency vets that I moderately trust (at a clinic we no longer go to) offered some insight that Peanut may be slowing down and his stools are smaller because he's become a bit dehydrated. It would be helpful to know exactly to what degree there was excess fluid in his body (I am not sure what severe excess fluid/moderately severe excess fluid is supposed to look like on an x-ray). They also chimed in that it doesn't make any sense that a supposed pocket abscess on/around his mandibular (lower jaw) tooth is placing pressure on his eye ball. But overgrown teeth pushing against his eye would. So maybe there is a partial misdiagnosis. I am hopeful for a certified radiologist to someday soon take a look at our x-rays. And put this all to rest. I apologise for not including this in my previous post. So we set out for a second opinion and there doesn't appear to be an abscess, according to Golan, in Peanut's mouth. We actually stopped the Baytril the day before after carefully rereading the notes from the previous veterinary clinic and saw they wrote "abscess on lower mandibular," for the cause of the weepy eye. Which, while we are not vets, did not seem to make sense to us at all. I was very hesitant to make that call on my own, but none of the vets were able to get back to me the week before or the week after (understandably the holidays). Thankfully it ended up being the right call to make. As for the pulmonary edema and the fluid his liver and lungs were taking on, she seems positive those are correct diagnoses. He's back on Lasix until he can get in for a echocardiogram (without anesthesia). I pushed for an ACE inhibitor of some kind just for the meantime, but she was hesitant to assign him one until we could find out more. There are some side effects I was not aware of in many ACE inhibitors apparently (still unclear). Their clinic's choice inhibitor is Enalapril. I'm hoping it's a type that also acts as a mild diuretic as well. Butter (Mr. Bloat) is still on the azithromycin and will have to stay on it for the full 20 day course. Thankfully he's showing some signs of improvement, like clear "discharge" coming from his singular nostril instead of opaque. But since his single nostril is still persistently wet and he sneezes a bit, we'll be staying on it for an additional 6 days. I hope month-long URI fighting is common in these cases. As for his kidney stones, Dr. Golan strongly feels there aren't any. And that the object of interest that the previous clinic had pointed out was actually something circulating in his gut. That was her interpretation anyway. When we finally saw his most recent x-ray in better resolution at the office again yesterday, I did notice a small trail/swirl of mineral/stone looking things in the lower left quadrant of his gut-area when viewing the "from the top." Please excuse my lack of knowledge when it comes to guinea pig anatomy, terminology, and radiographs. I only noticed the collection of minerals from being able to view examples on here, which I am very grateful for. During my lunch at work today I'll try and post a link to an image hosting site (something I've picked up on as an alternative to bothering Lynx about posting photos for users on here--please correct me if I surmised incorrectly) to Butter's x-ray with the mineral cluster circled. Hopefully all of the above is being exacerbated by this bout of dehydration we're experiencing. Which the vet said is hopefully being brought on by the antibiotics. I certainly hope that's the case. Otherwise it's 25-30ml hand syringed water everyday for life. I believe that's it for now. Both of their teeth looked good to her, no need for trimming in her opinion. Our vet will be gone for 3 months to have a baby, so I'm selfishly praying nothing major happens during those 3 months. And that her delivery goes smoothly, of course. It is actually helpful to have the pictures on your thread permanently for future readers. But you could certainly put them up using a different host more quickly. If you are okay with my continuing to add the most clear and useful ones to your thread permanently, that would be great. Sounds like you got some good info (ruling out a couple issues). Your vet can also show you how to administer subcutaneous fluids 2 or 3 times a week (vs. syringing fluids). This is most frequently done (if I remember right) with kidney and/or stone issues. I did notice a small trail/swirl of mineral/stone looking things in the lower left quadrant of his gut-area when viewing the "from the top." Do they look like the string of stones in the ureter shown on this page? Thank you I didn't get around to doodling in his x-ray this afternoon. But will mail the image to you to post instead. I did ask about getting trained in Sub Q, they didn't want to train me to do it unless he had confirmed kidney failure. Yes it looks almost exactly like that swirl of stones but it's farther above his left hip. Almost underneath his lowest left rib and closer to the vertebrae. I'll get on that doodle after this. I had a more pressing question I hoped someone could address---i think with the stress yesterday coming and going, and being at the vet, and that dang oxbow treat creating a huge grit pile, we undid everything from before. He began showing signs of blood again. I set him aside in a "sterilized" (alcohol, wiped with clean paper towel, alcohol, then finally air dry) plastic bin and did a full dip. No blood or leukocytes showing up. Pees on a clean towel or bedding, test on the towel (not the best way, I know) tests fully positive for blood in every part of the urine puddle. That was not the case this morning. Now we've done this before with the same towels and it has tested negative multiple times (while the gritty center tested positive). I considered it may have been the residual bleach in the towels (though we also do a double rinse) however, the clean fleece bedding he just urinated on (that doesn't get bleached) tested positive for blood, with a full square field totally blue. So my question is, with UTI's, can you have intermittent results for blood? We'll keep testing as the night goes on. But I'm concerned his pre-urination in the sterile bin didn't have any blood trace in it due to it being not a complete elimination. He sat next to me in the chair while I sat there to test the urine for a good couple minutes and didn't urinate anymore. The second we placed him in his home, he urinated a bunch more (ugh) and that's when we tested the non-bleached bedding--which came up positive for blood. I would love to just drop by the ER clinic tonight that's 40 min away, but a few factors: it's -1F wind chill, we're just about out of resources, hitting past the $2k mark on these guys this season, and speaking of funds we would have to cab it. We were saving that money for the echocardiogram for Peanut but obviously we don't want to risk one pigs life over another's preventative care. I really hoped to get some experience input on at home urinalyses and testing. The vet mentioned that porphyrins in urine can also create a false positive for blood on urine test strips. She didn't explain how that could be... other than the urine is orange. Which I'm not sure if she understood that the field for blood on those strips already start out orange and turn blue with blood. Though we've tested Butter's porphyrin urine many times before and it's come up negative for blood. Does anyone have any knowledge or experience with this? Can anyone help with this? Sorry my heart is in my throat right now. I hope I'm making sense. I'm not sure about all the possible reactions with the strips, but the general consensus is that they're not reliable for pig urine. Herbivore and carnivore urine have very different characteristics, and can react very differently with the strips.